Bookings/orders are planned trips and can be referenced in invoices later on. In contrast to this you can track all tours in the tour log. All orders can also be retrieved in the report section together with tours. If these details are completed, no error message will appear when saving the drive by clicking the ‚Done‘ button. It is possible to save the trip even with incomplete data. If you want to change a booking later, the drive is initially read-only. Click on the icon and the write protection is switched off. If the tour is saved for the first time, you can save a return trip immediately afterwards. For this, the pickup and the destination are exchanged. Only the pickup time has to be checked and then the return trip can be saved. If you want to enter a return trip later on, select the trip in the „bookings“ overview menu and then select the item „Plan return fare“ via the system menu ( ). The pickup time is entered in a menu that also takes into account the previous and subsequent trips. The journey is entered in a calendar. 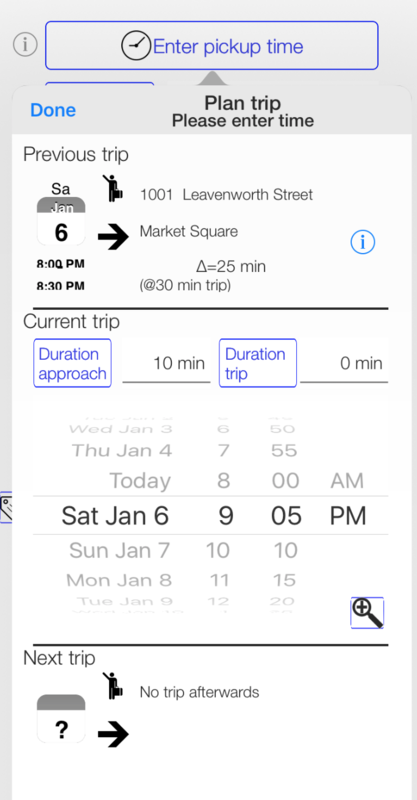 If you enter the prep time of the journey, you will be alerted in advance by the calendar. The driving time is also marked in the calendar as „busy“. If a series of trips is planned, choose whether to schedule a daily, weekly, or monthly recurrence. Also repetitions every 2 weeks or every 5 days are possible. The number of repetitions must be specified. Thereafter, a selection of the recurring dates is indicated. 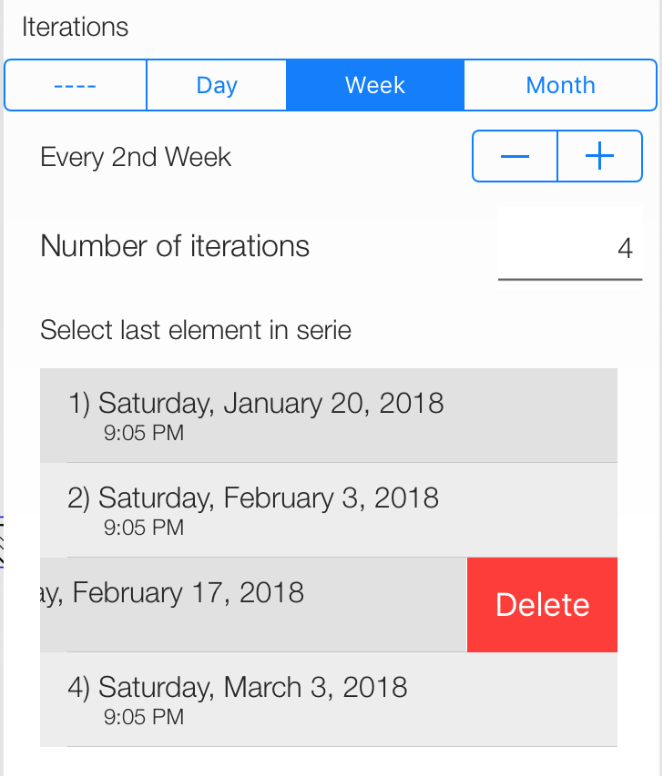 With a swipe to the left single appointments can be removed from the series. The above example repeats the drive from January 6th every 2 weeks (Saturdays at 9:05 p.m.) 5 times. The 3rd repeat on the 17th of February is currently being deleted. Passengers can either be selected from the address book or typed using the keyboard. If a contact is selected from the address book, the e-mail address (for confirmation E-mails), the telephone number and the address (used as the start of the tour) are also copied. If there is more than one entry in the address book (for example, a mobile phone number and a landline number for the telephone), you can select the appropriate phone number. You can enter names (e.g. 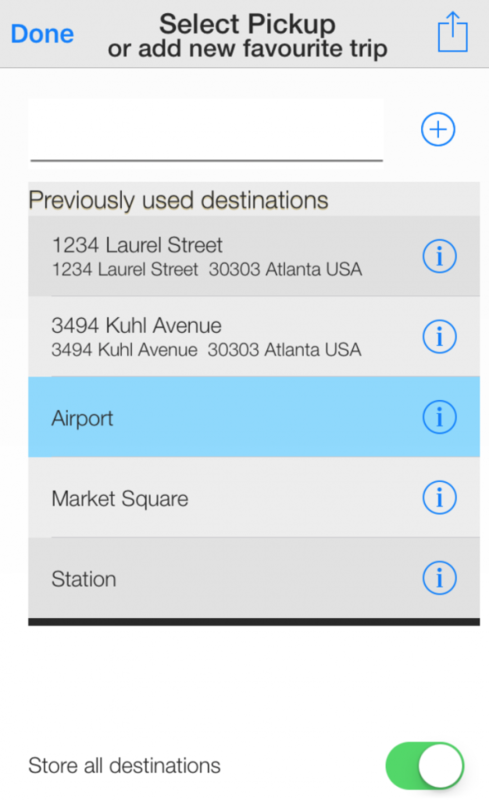 airport) as well as complete addresses in the text field. Pressing the appropriate button will bring up a selection of targets that are used frequently. If you click on a destination, the address will take over into the tour. After entering the address, route planning ( ) is possible. In the example, all destinations entered as the destination or pickup location are transferred to the frequently-used location list. If you press the -button, you can look for a map on the exact location. Dieser Eintrag wurde veröffentlicht in Taxi Data Manager english und verschlagwortet mit booking, bookings, edit, invoice, pickup, repeat, repitition, trip . Lesezeichen auf den Permanentlink.